OPBF bantam champ Malcolm Tunacao, who defended his title the other night in Kobe Japan via fifth round technical knockout of Hidenobu Honda, is looking forward to challenging WBC superfly champion Tomas Rojas of Mexico. "I want to challenge for the WBC title against the Mexican at superfly. I feel I can still make 115 pounds," said Tunacao in an interview with this writer. Tunacao, who is set to return to the country next month for the holidays, ruled as a WBC flyweight champion defeating Manny Pacquiao's tormentor Medgoen 3K Battery. 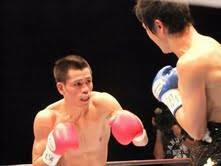 The fight against Honda was his second OPBF title defense. "He hit me with a good hook in the opening round, and I was groggy, but recovered. In the third, I had him in trouble also with a hook. Then in the fifth, I hit him again with a hook, then followed it up so the referee stopped the bout," Tunacao told Cebu Daily News. TOP PHOTO: OPBF bantam champ Malcolm Tunacao batters challenger Hidenobu Honda in their title duel Tuesday night in Kobe, Japan. Contributed photo.